Happy 2102, Year of the Dragon! 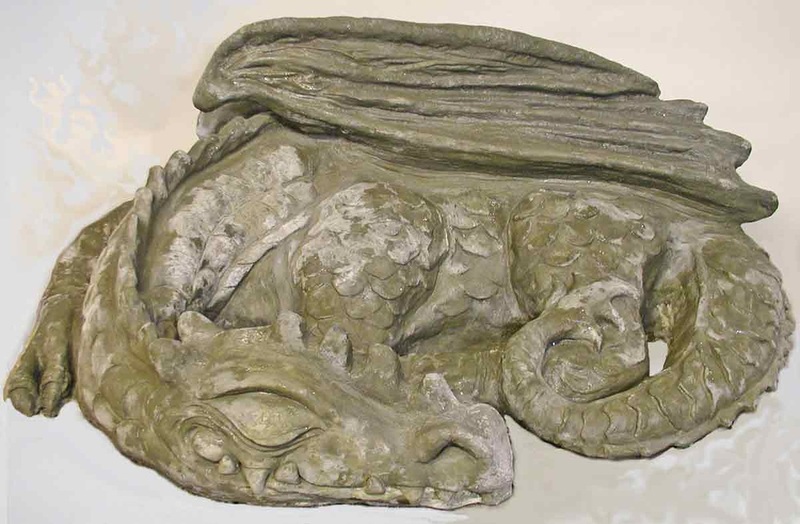 Announcing the very first cement cast of the large Sleeping Dragon! Click on this "warts and all" picture to see it larger. I hope you like it. The splotches are temporary and will disappear when the entire sculpture's surface dries. I wanted to get a better picture before publishing, but this will have to do for now. Creating the final picture takes a lot of time. After I get the shot set up, I work on it in Photoshop. I don't do this to enhance how it actually looks. I try to only improve upon how it appears in terms of accuracy. I usually have to work extensively to improve the background appearance. If, when the dragon thoroughly dries, any splotches show up due to bleed-through of the bonding agent, they'll be concealed under a layer of paint. I don't think that will be much of a problem, but must wait and see. I haven't actually seen it yet when it's totally dry. I can't wait to see it in metallic silver! I'm thinking: 1) Paint on an underlayer of white primer, 2) maybe paint matte black into the recesses, and then finally, 3) paint all of the raised areas in metallic silver. I don't have the time right now to do the painting. In the meantime, it will look fine as it appears now, in its natural cement color. A bit of greenish cast has developed as it cured under damp newspaper and plastic. This may disappear over time, depending on the conditions in its final, permanent environment. Some people intentionally grow a layer of green moss over the surface. It would look nice that way, but it would hide some of the details. This is the same size as the original latex mold from which it was cast. It's about 41" long by 24" high by about 29" deep. this way on a new copy. Therefore, this copy is a custom, one-of-a-kind, first edition sculpture. I hope it makes up for any disadvantage the owner assumed in accepting the first cast. Plus, as most of us are aware, the first edition of anything in the art world usually increases in value over time. The rebuilt areas have the same or even better strength than the original due to the composition of a special cement additive. Another plus. The reason for the revisions was that the mesh size of the reinforcement netting (which I placed inside as I was casting the surface layer) was too small. It didn't allow cement to penetrate to the surface layer and caused gaps in the cement to show on the surface. Unfortunately, problems like this can't be detected and corrected for until after removal of the finished cast from the mold. The good news is that with the application of the modern technology being made available to us, the potential for repair and correction is exponentially increased. In this age of recycling, it's so good to know that products exist on the market that allow for making corrections like this without sacrificing the quality of the finished piece! And without having to settle for letting a masterpiece degrade into a worthless discard due to lack of repair technology. are in order! I'm guessing you weren't expecting these perks! They're hard-earned and very well-deserved! Thank you for all your patient witnessing of this creation in real time! customers like you make it all worthwhile. Thank you so much for your loving support and appreciation! If you're interested in having me make one for you, get in touch with me whenever you like. But please keep in mind that this is a very large project. I estimate that the next one will be finished sooner than the approximately 6-7 months it took to create the first one. because the time taken up to create the mold will be eliminated. It takes a lot of careful planning to make this - assembling the mold parts, casting layers of cement in stages over several days, then undoing the mold when it's ready to be dissembled. Next, the finished cast is carefully removed from the mold. The surface is inspected and refined with special tools and materials. During the last stage, the dragon has to be cured for about 3 weeks so that it's strong enough to be safely transported it to its final destination. I estimate that the total time from start to finish of a new copy of this dragon will take about 2 to 4 months. The speed also depends on weather conditions in my location. If the weather is too cold in my garage where I do the creating, I have to heat it as much as I can without blowing my budget on the heat cost. This is one reason why I don't plan on making any new copies this winter, but will wait until the weather warms up. It was a joy to do this, not a displeasure. It just needed more time than we in Western culture have become accustomed to when dealing with a normal transaction. This is anything but normal, but in a good way, I promise. You'll be pleased with the end result. I guarantee it. I'm so grateful to have had this opportunity to expand upon my artistic creations. This one was created for my friend's business. She was SO-O-O wonderfully patient as she waited for the entire last half of this year, 2012, while the idea for this sculpture slowly grew and evolved into a finished product. It was also a lesson for myself about patiently seeing this large of an undertaking through to the finish. There were many unpredictable, but necessary stops along the way. I soon learned that it was the dragon - not me - who was actually in charge of time. This extraordinary project challenged me to devise - even invent - solutions to special problems as they arose. Most of this happened as I worked on the rigid outer casing for the flexible inner latex mold. The outer casing is known as the "mother mold". But even before the mother mold stage, there were features such as undercuts in the latex mold, where I had to build up or break down shapes so that the mold would release from the cement without causing damage. I've learned over time that, when sculpting, the creation of a mold is a necessary evil. It's terribly laborious and time-consuming, but once it's done after the first project, it no longer consumes the huge amount of time that it required initially. (For as long as the mold lasts, that is.) Without a mold, if at any point, the sculpture is damaged or destroyed, it can be tragic. There may not be a good way to reproduce it and recover what was lost. A mold, made at the beginning, is the best insurance against almost any form of mishap.